Goals from Craig Clay and Scott McDonald earned Motherwell a crucial 2-1 Scottish Premiership victory at Inverness Caley on Wednesday night. Motherwell – boosted by the return of Carl McHugh to the midfield after four months out injured – almost went ahead after just three minutes when Stevie Hammell’s free-kick was flicked on and Caley keeper Owain Fon Williams saved the ball at the second attempt. ’Well suffered a blow on 25 minutes when Chris Cadden limped off. The youngster was replaced by Lionel Ainsworth. And the English substitute almost got his name on the scoresheet when his 27th minute cross drifted inches wide of the post. Caley then came close to breaking the deadlock themselves when Greg Tansey’s long range effort was tipped round the post by goalkeeper Craig Samson. And the hosts threatened even more when Brad McKay’s cross was headed against an upright by former ’Well player Iain Vigurs. Inverness player Larnell Cole was then fortunate to escape with only a yellow card for a robust challenge on Lee Lucas. Lonsana Doumbouya shot just wide for Caley early in the second half before Motherwell took the lead in wonderful style. Midfielder Clay netted his first goal for the club when he sent in a stunning, dipping shot from distance past Fon Williams. Samson produced saves from wind assisted shots by Vigurs and sub Aaron Doran, before Doran came agonisingly close when he shot against the underside of the bar after 82 minutes. 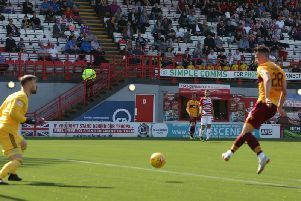 And the visitors – backed by a boisterous band of supporters – went 2-0 up with just three minutes remaining when Scott McDonald’s half volley found the net from a Louis Moult pass. Just when it looked like Motherwell could relax, they conceded a late goal when Greg Tansey scrambled the ball home for Caley. But the Steelmen saw out the three minutes of injury time to land a crucial victory which puts them up three places to seventh in the Scottish Premiership table – just one point off the top six – ahead of Saturday’s trip to Hamilton Accies.